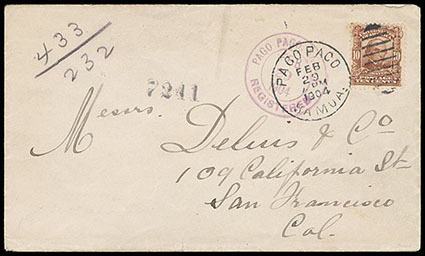 Samoa, Pago Pago, Samoa, Registered, Feb 29, 1904, purple double-circle datestamp on cover to San Francisco Cal. bearing U.S. 10¢ pale red brown (307) tied by "Pago Pago, Samoa, Feb 29, 1904" leap year duplex, San Francisco (3.15) arrival backstamp, Very Fine. 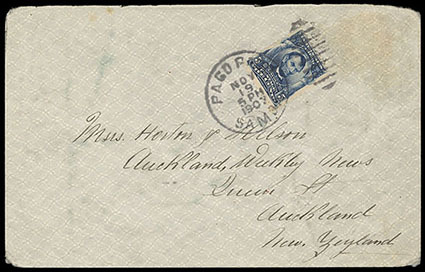 Samoa, Pago Pago, Samoa, Nov 19, 1907, bold strike of duplex ties U.S. 5¢ blue (304) on cover to Auckland, New Zealand; some edge wear, Very Fine and scarce use to New Zealand. 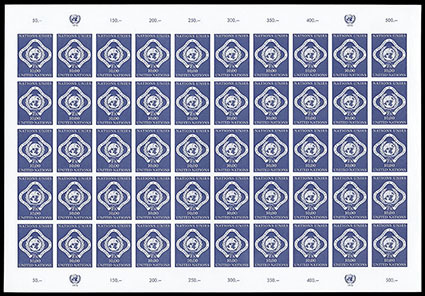 United Nations, Geneva, 1969, 10fr dark blue, imperforate, complete sheet of 50, o.g., never hinged, fresh and Very Fine. Scott No. 14 var. Estimate $3,000 - 4,000. A GREAT U.N. 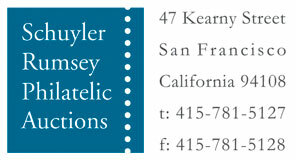 RARITY - WITH ONLY TWO SHEETS OF 50 ISSUED.